Dimethyl phthalate has applications in drug, cosmetics, plastic, textile, pigment, glass industry. It can be used as a solvent, plasticizer, dye carrier, textile lubricating agent, active ingredient in insect repellent composition. Dimethyl phthalate (DMP) is a clear, colorless to light yellow, oily liquid with a slight sweet odor. It is slightly soluble in water, soluble in organic solvents (e.g. methanol, diethyl ether). Stable under ordinary conditions. Incompatible with strong oxidizing agents, strong acids or bases, nitrates. Sensitive to prolonged exposure to light. 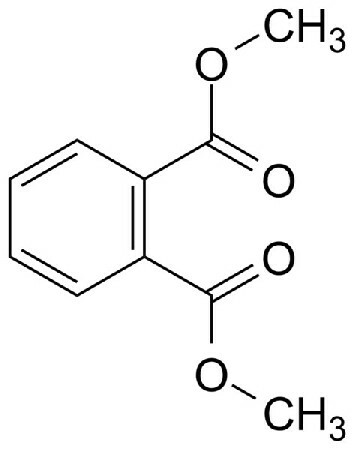 Dimethyl phthalate is an antiparasitic drug (ectoparasiticide), used in the treatment of ectoparasitic infestations such as nematodes, cestodes, trematodes, infectious protozoa, and amoebas. It can be applied for treatment of rickettsial infections, as a miticidal agent. DMP has an application as insect (for fleas, chiggers and flies on horses and cows) and mosquito repellents in some topical formulations such as creams, aerosols and lotions, and in pesticides. Used in veterinary medecines as a plasticizer in film coating, at levels of 0.1% or below. Dimethyl phthalate has an application as a plasticizer, solvent and fragrance ingredient in a wide variety of cosmetic product types. It can be found in some hair care products, including aerosol fixatives and other cosmetics preparations such as bath, eye shadows, wave sets, nail polish, nail polish remover, nail extenders, after-shave lotions, and skin care preparations. Dimethyl phthalate plasticizers polyvinyl acetate and rubber. It is used as a plasticizer in cellulose ester plastics, such as photographic films and sheets, blister packaging and tape applications. DMP imparts flexibility and impacts strength of plastics. It makes plastics more flexible in products such as toothbrushes, automobile parts, tool handles, toys and food packaging. It is applied as an additive in polysulfide rubber to reduce shear strength. Dissolves many natural resins, glyceryl-phthalate resin and may be used with coumarone resins. - additional uses in textiles, glass industry.